The Lotus Mark III was the third Lotus model produced. It came about when Colin Chapman and his partners modified three Austin Sevens to compete in the 750 Motor Club formula. 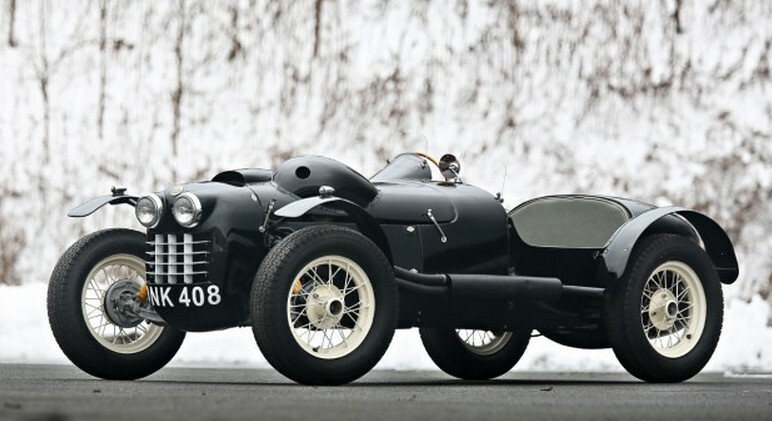 One car was completed in 1951 before a man named Adam Currie came around to the Lotus shop and ordered this car, the Mk IIIB – the first Lotus ever sold to a customer. It is also the first car to wear the legendary yellow Lotus badge. The engine is a massively reworked straight-four from a Ford 10 that was slimmed down to 1.1-liters. Horsepower is estimated at 50. The body is aluminium and the car was raced in period by Colin Chapman, Adam Currie, and successful hillclimber and Formula One driver Tony Marsh. The car’s competition years lasted solidly through 1954. The current owner acquired the car in 1994 from long-term ownership dating back to the late 1950s. A restoration was performed in 1995, taking it back to 1953 race livery. This is an important Lotus, one of the oldest examples money can buy. It can be yours for between $250,000-$450,000. Click here for more info and here for more from this sale. This entry was posted in Uncategorized and tagged 1951, auctions, cars, classic cars, gooding & co, lotus, mk iiib by classiccarweekly. Bookmark the permalink.